if you're like me, i suspect that you're following the Olympic games in London and are awaiting the opening ceremonies. i'll probably be inspired to write some posts in response to Olympic events, as i am every time to what is probably one of the greatest global sports phenomenon in the modern era (if not all time). this might give endurance athletes some room for smug satisfaction, since it shows us as demanding--and hence expending--the greatest amount of energy. but i want to remind everyone that this is due to the time requirements of endurance events, not just in terms of training but in the actual events themselves, which typically last much longer than other competitive sports. i suspect that if we looked at the intensity of energy expenditure in terms of calorie per minute we'd find different results. having said that, it is interesting to see which sports require more calories. it probably hints at which sports are more appropriate for those trying to lose weight--although, it should be observed, calories expended have to be greater than calories consumed in order for their to be weight loss. interesting, huh? at least now we have some data for discussion. i'll issue a caveat and say that no amount of calories will ever necessarily translate directly into athletic performance. it's not just about how much energy you take in or expend out; it's about how you translate that energy into performance. which is where skill comes in. so it's not only about training volume responsible for these caloric quantities, but also about training quality converting these calories into results. but in the meantime you can still feed good about telling everyone how endurance sports and endurance athletes rank in terms of working hard and eating lots. have at it, kiddies! so the past few weeks i was away on a family vacation doing something that i think may interest readers of this blog. most of you are like me: endurance athletes who do what we do for more than competitive reasons, with our physical endeavors serving to fulfill intellectual and spiritual components of our lives, such that we are able to find answers to the unresolved mysteries that eternally call to us and compel us forward to explore their glory. and so we chase after distances in all its manifestations: ironman and ultraman triathlons, ultra-marathons, endurance swims, gran fondos, anything involving long miles with long days under long skies with long horizons that allow long thoughts with long reflection. well, i found another one to add to the list. 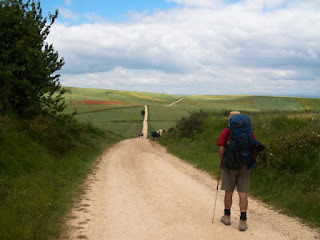 in Spanish it's called the El Camino de Santiago, or Camino Santiago or sometimes just Camino, in French Chemins-de-Saint-Jacques-de-Compostelle, in German Jakobsweg, and in English the Way of St. James. it takes place in Spain, occurs at any time of your choosing, with no time limits and no set distances, and allows nightly rest stops. the catch? there's no support crew, it's meant to be done solo, traditionally calls upon 500-800 km of hiking, and you carry all your gear on your back. as the name implies, it originated as a religious pilgrimage to the burial place of St. James, the Apostle, located in the Catedral in the town of Santiago de Compostela in the region of Galicia of northwestern Spain. while ostensibly Catholic, and hence Christian, it's become a secular draw, with people of all faiths and even atheists taking the path to experience what all pilgrims on the way are expected to experience: deep contemplation and extended reflection. i estimate that about 50% of the pilgrims we met were atheists, pagans, or (like me) heathens. i'll offer my own personal experience from the past few weeks: it's not as easy as it looks. we did not complete it, and technically didn't even start, and in fact ended up doing it in reverse. we made a lot of newbie mistakes, in that we didn't do enough research to learn about what it requires to do the Camino Santiago (there's a lot to walking 20-30km everyday with a 30kg backpack), we assumed that walking is easy (there's a lot to walking 20-30km everyday with a 30kg backpack), and we did not take it as a serious athletic event (there's a lot to walking 20-30km everyday with a 30kg backpack). it also didn't help that we didn't know that much Spanish nor knew that much about Spain--the terrain in northern Spain is hilly and the weather is variable. having said that, i want to do this again. but i want to do it the right way, correcting all the mistakes we made above. it is what it's promoted to be: a physical activity that engages very mental and spiritual aspects within you. i found it similar to other endurance sports, in that you spend a lot of time alone thinking, but then also get to share a lot of time with other pilgrims who are doing the exact same thing as you. it's also similar in that you are going over distances with vistas and horizons that are inspiring--the Spanish countryside is, to say the least, beautiful--and you can't help but be induced to contemplation. it is different, however, in that it's much longer--while the Catholic church requires a minimum distance (100km if by foot, 200km if by bicycle or horse) to receive an official compostela (certificate of completion), many pilgrims undertake far greater distances (usually 500-800km starting from the traditional starting points, or--for those *very* traditional--as far as the distance from their own home: i met 1 pilgrim who started from his home in Poland). it's also different in that there are many different options for routes, with historical paths starting from places in Portugal, Spain, France, and even England, all converging on Santiago de Compostela. in addition, it's different in that everyone goes at their own pace, and so some pilgrims spend a few weeks (like us) and others spend months. you get a very different feel for life, and you connect with rhythms of living completely lost to modern lifestyles. it's refreshing. for all the mistakes we made, i found it fulfilling. and a great way to engage in "deep" tourism to really get to know the culture, land, and people. it's the kind of enriching experience that everyone should get to have, and one that many endurance athletes strive to reach, and certainly one that all of you seek. highly recommended...and if you go, let me know. i might be down to join you. yeah, ok, i know. it's been awhile. over 2 months since i last posted. i don't have much of an excuse, other than the usual culprits. things have been a little busy lately and i've been a little pre-occupied. there's been some things personally and professionally that i've had to devote some attention to, and they've taken up my time and energy. i haven't forgotten this blog, and i'll try to post as much as i can. but like so many other people in this economy, i'm having to prioritize things as a matter of survival and constrain things to the essentials. that's meant paring down and becoming a lot more frugal. just like so many of you: i'm just doing the best that i can.